Prone: The patient is positioned prone after successful induction of general anesthesia, placement of monitoring electrodes, and insertion of a Foley catheter. Skin incision: The skin is incised midline over the lumbar spine, and dissection is carried down through the paraspinal muscles taking care to maintain the integrity of the bony elements. Intraoperative plain radiographs may be needed to confirm the correct level with a Penfield #4 under the desired lamina. Exposure of dural tube: The interspinous ligament is removed, and a small hemilaminectomy is performed. The dura is then opened and the filum identified. Mapping of nerve roots: The motor roots can then be stimulated while evoked muscle contraction is monitored to confirm their location. The filum can also be tested to make sure there are no roots adhered to it. 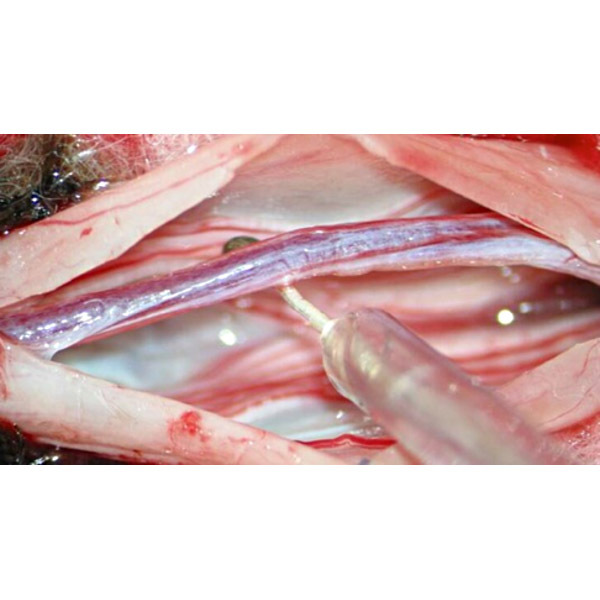 Intraoperative view of stimulation of intradural structures: Shown is a filum terminal being stimulated by a mono polar probe monopolar probe (arrow). Cutting of filum: Once the absence of function is confirmed, the filum is coagulated using bipolar cauterization and cut using microscissors. A section may be removed and sent for pathology. Routine dural closure: The dura is approximated. A 4-0 silk provides a durable closure. A valsalva maneuver is typically performed to confirm absence of CSF leak. Fibrin glue can be used to reinforce the closure. We use and oxidized regenerated cellulose matrix in alternating layers with fibrin glue to buttress the repair after the wound has been irrigated with antibiotic-containing saline solution. Fascial closure: Fascia and muscle closure is completed. The authors prefer to use absorbable suture in an interrupted manner for these layers. Routine closure muscle and skin: The wound is closed in anatomic layers using absorbable sutures in a subcuticular fashion with skin glue to the outer most layer of skin. Gentle awakening: The patient is awakened from anesthesia with minimal coughing and positioned flat for 3 days to decrease the risk of CSF migration through the closure.